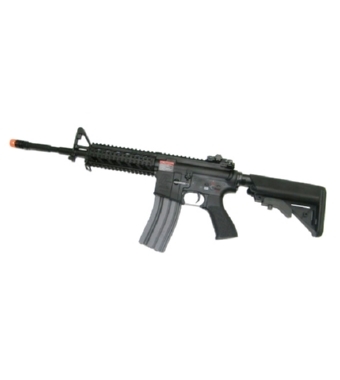 PRODOTTO DALLA G&G (TAIWAN), FUCILE ELETTRICO MODELLO M4 RIS RAIDER CQB LONG FULL METAL, COLORE NERO. UTILIZZA BATTERIE CQB TYPE 8,4V-1100 mAh (NON COMPRESE), CARICA BATTERIE 220V-300mA (NON COMPRESO). RIS ANTERIORE E GUSCIO IN METALLO, 5 SLITTE WEAWER PER ACCESSORI, CALCIO CRANE ESTENDIBILE IN FIBRA DI NYLON, SPEGNIFIAMMA IN METALLO.